The country's oldest polar bear died on Friday at the Philadelphia Zoo. Klondike was 34-years-old. Zoo officials started noticing a serious decline in her health starting two weeks ago and she had difficulty standing and walking. Despite treatment she was not improving and they decided to euthanize her this morning. 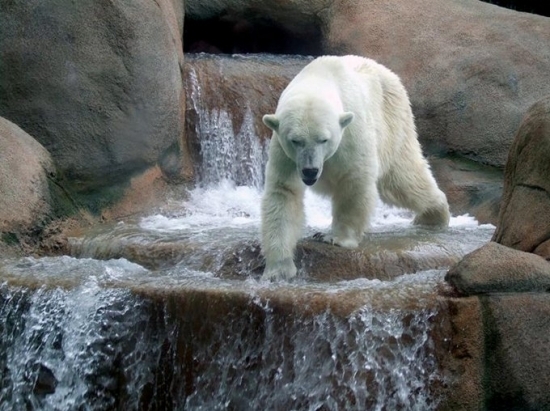 Klondike was born at the Bronx Zoo in 1980 and has lived at the Philadelphia Zoo since 1981. She far outlived the average life span of a bear in captivity which is 24. Her companion, Coldilocks, is now the oldest living polar bear. She is also 34. A group of students gathered on the campus of Villanova University this afternoon to protest the recent decision to add armed police officers to the Public Safety Department. The group of over 100 students called "Concerned Villanovans" marched from Saint Thomas of Villanova Chapel to the middle of campus near the 'Oreo' for a silent protest. They don't feel their voices have been heard and that adding officers with guns is acting out of fear and does not represent the values of the Catholic institution. Villanova plans to put 20% of it's 75 member public safety department through police academy in time for Fall 2016. Besides being armed, they will be able to use lights and sirens to respond to emergencies, communicate directly with other law enforcement agencies, have access to crime fighting databases, and be able to detain and question suspects. Other students welcome the changes and feel that they will be bettered protected on campus in case anything would happen. Clear skies, temperatures in the mid 50s this evening in Center City.